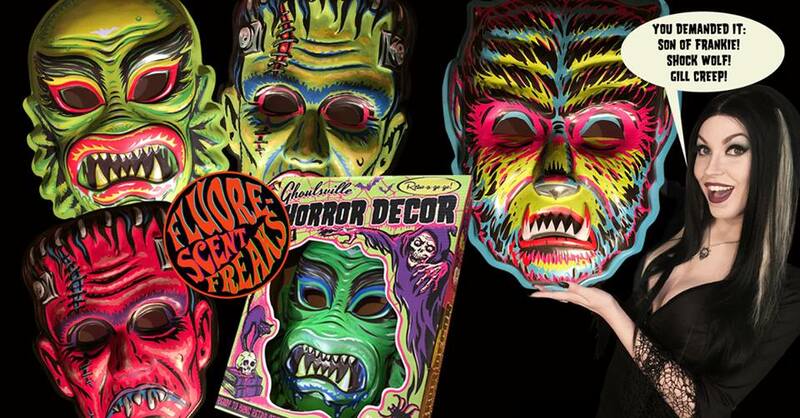 Home / News / 20% Off Ghoulsville Wall Decor Masks by Retro-a-go-go! 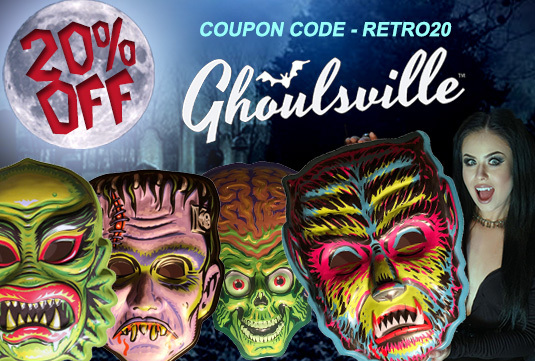 20% Off Ghoulsville Wall Decor Masks by Retro-a-go-go! Just in time for Halloween! Regal Robot is excited to offer 20% off of the full line of limited edition Ben Cooper-style Ghoulsville Wall Decor Masks Through October 18th! A Halloween special just for classic costume and monster fans! Use the coupon code RETRO20 on checkout and you can get a 20% discount on all of the original Ghoulsville Wall Decor masks from Retroagogo! Shop now in our More Decor section and use that coupon to save! These groovy, larger than life masks are as fun as can be, and ready to hang on the walls of your home, office, shop, man cave or fan cave! They’re amazing Halloween decorations, and the perfect bit of classic kitsch for monster kids who happen to like a bit of monstrous decor all year round! Each fantastic wall hanging mask towers around 2 feet tall. And best of all, the whole series of Vac-tastic Plastic Ghoulsville wall décor masks is now 20% off with the coupon code RETRO20, valid until midnight PT on October 18th! Each design is a limited edition and once they have sold out the design is retired. So get them before they’re gone! Head over to the MORE DECOR themed furniture and art shop page and check out the full line up of creeps, astro-zombies, aliens, wolf-men, vampires, devils and more! Our retro-mask decor sale is for a limited time, so get yours today! Designed in the USA, each Vac-Tastic Plastic mask wall decor is thoughtfully inspired by warm memories of costumes, characters and playsuits of the 60’s-70’s found at the local Five & Dime Stores! Now bearing the Ben Cooper name, these instantly call to mind the classic costumes so many of us wore into the early 80’s. They’re created in the same spirit and material used for the much-loved vintage masks and decor we all loved as kids and each collector’s edition box is an homage to the original boxes and packaging of yesteryear, right down to the clear plastic window showing your ghoul within! Whether you add them to the walls of your home, office, retail location, monster man cave or fan cave… or keep them “mint in box” and proudly displayed, nothing else that can match the creep-tastic awesomeness of Vac-Tastic Plastic wall hanging masks! So remember to use coupon code RETRO20 on checkout and go ORDER YOUR HORROR WALL DECOR MASKS TODAY! NOTE – Offer requires the coupon code RETRO20 and is available from 10/8 through 10/18 on select items only. Discount does not apply to shipping or any sale items. Please see our site’s Payment, Shipping and Returns page for further details about coupons and discounts. New for 2018! Fluorescent Freaks by Retro-a-go-go!